As a food blogger and somewhat maniacal cook, everyone expects that I'll cook all the big holiday meals. And most years I do. Most years I enjoy the cooking frenzy. Most years I enjoy the challenge. Most years I enjoy the planning and the shopping and the prepping. But every once in a while I think that it would be nice to relax and enjoy the holiday. Put my feet up before dinner, then wait for my empty plate to be filled. If I was part of a big family, holidays might jump from house to house to house. Or maybe I'd have a crowd of people in the kitchen helping me peel and stir and mash and whisk and grate and it would be a heck of a lot of fun. But the only jumping that happens on most holidays is me jumping from oven to sink to stove to refrigerator while I'm prepping and serving and cooking. And then when I sit down to eat, I feel like I've already eaten it all, after tasting and seasoning and stirring and living with all the sights and sounds and smells of that cooking food. At about that point, the thing I most want to eat is something that I didn't prepare with my own two hands. But still, most years, I want to do all that work. I take pride that every single little thing was prepared from scratch, even if I had to start prepping six days earlier to accomplish it all. A few years ago, I suffered great angst when I bought bagged salad instead of choosing lettuce and hand-tearing it for salad, but no one noticed. Or at least they didn't comment. Afterwards, I felt a little dirty, but also a little relieved. The next year I bought a cake from a charity bake sake. But some years, even that isn't quite enough help. When my good friends at Whole Foods recently offered to give me a full holiday meal, I didn't hesitate for two seconds. Heck yeah. It was the best of all worlds. I got a whole meal that I knew was going to be good, and I got custody of leftovers. I still had to heat it up and plate it and do some cleanup afterwards, but someone else did all the heavy lifting for me. It was an interesting process. When I arrived at Whole Foods, there was a kiosk right inside the door where I gave my name and they said they'd call me when it was ready. They pointed to the pickup area and said that I could have some free hot cider, if I wanted to chill for a few minutes. Instead, I wanted to pick up a few non-Thanksgiving things, so I took care of that, and before I was done touring the store, my name was called and someone showed me the order, pointing to each item in the box and showing me the instruction sheet for reheating. 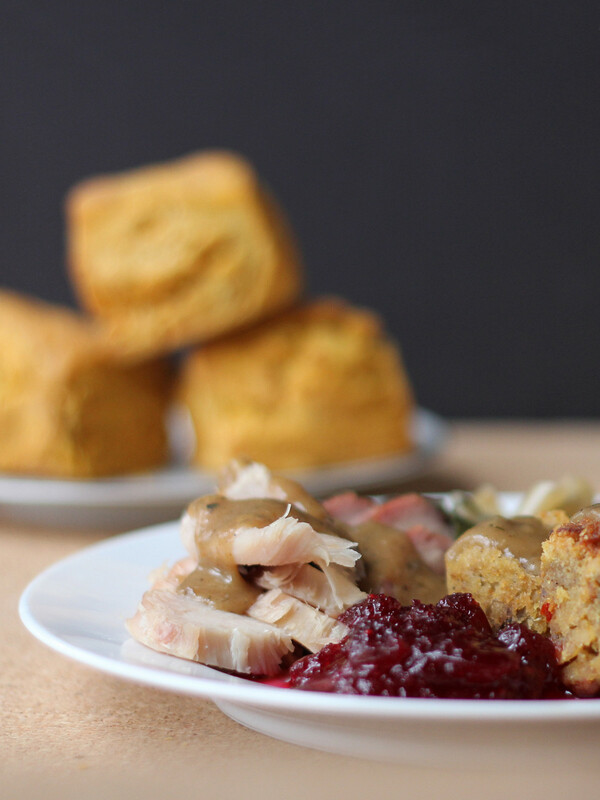 The meal included a smoked turkey, mashed sweet potatoes, collard greens, bourbon gravy, Southern-style cornbread dressing, cranberry sauce, and sweet potato biscuits. Here it is on a plate, where it belongs. And for dessert, there was a pretty spectacular flourless chocolate cake. We were out of the store in about 20 minutes total, and everyone in the store was cheerful and helpful and friendly. It was incredibly simple. Non-stressful. They even included a disposable aluminum roasting pan for the turkey, and the containers that held the dressing, potatoes and collard greens could be used in oven or microwave. I wouldn't say they were attractive enough for serving for a nice dinner, but if you moved into a new house and hadn't unpacked the serving pieces yet, they'd be fine. The smoked turkey was pretty spectacular. My mother-in-law is a big fan of wings, so she claimed that right away. For leftovers, we had hot turkey, turkey sandwiches, turkey chili, and then bones and odd bits ended up in the stockpot to make a nice smoky stock. I ended up with 2 quarts of a very flavorful stock. Keep in mind that this was a meal that was described as sufficient to feed 4 people, and there were three of us for dinner. Three normal adults, not three starving teenagers, but there's no doubt we could easily have fed a few more for dinner, since there were leftovers of every component. But I was giddy to have the leftovers because I love day-after turkey sandwiches. 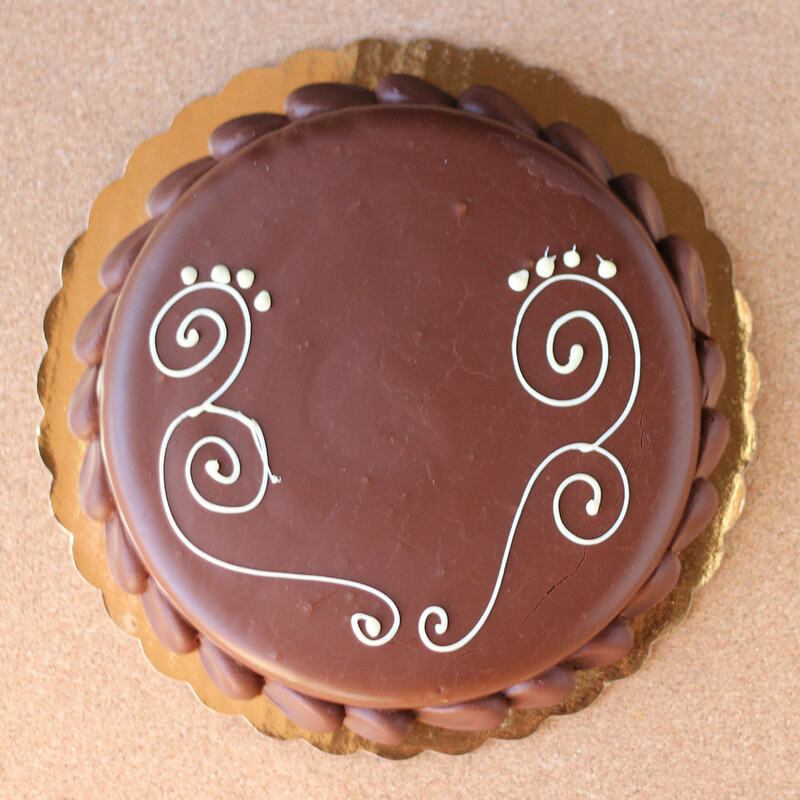 And did I mention that the cake was good for leftovers, too? Yeah, that's what I'm talking about. That's a flourless chocolate cake that's really rich and amazing. Imagine a cross between cheesecake and fudge, and you've got an idea. This a very welcome holiday treat for me, and I have to thank Whole Foods for their generous gift. I was able to put a great meal on the table without spending time that I didn't have, and I got to enjoy the meal like a guest in my own home. I'll admit that I'm not going to order holiday meals from Whole Foods for every holiday from now on, because I do love cooking, and I love showing off my cooking to guests. But next time I'm too stressed and need a break, I wouldn't hesitate to order from them. I'm already eyeing some of their other meals. The crazy thing is that what they charge for these meals is pretty affordable, considering what it usually costs me when I go shopping pre-holiday and considering the quality of what I got and how many extra meals I got from it. The downside to ordering a holiday meal like this is that the menu is set, so if you have a family favorite side dish that you absolutely have to have, you might have to do a little bit of work. But making one side dish or opening a bag of salad greens isn't a big deal compared with the hoopla involved in making the whole meal. 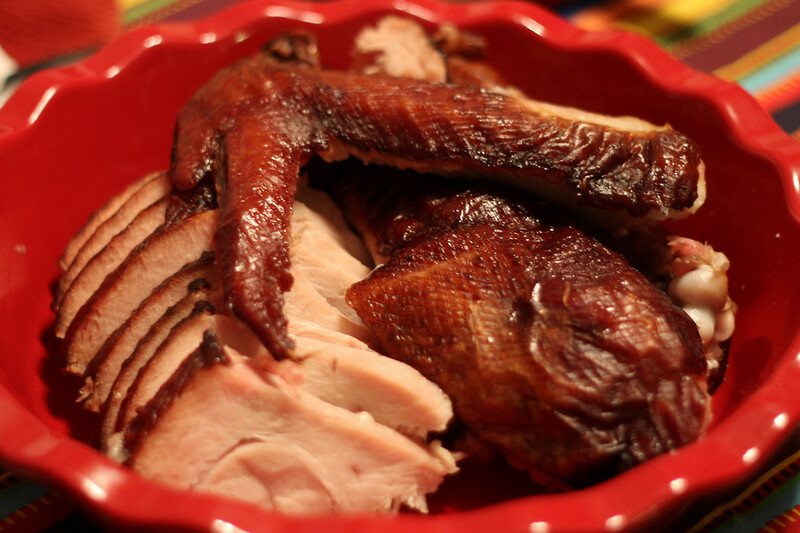 Besides smoked turkey, they also have several types of roast turkey, but that's not all. Right now (at my local store) you can order ham, leg of lamb, roast beef, roast pork, or a complete vegan meal. One thing I think is really cool is the "classic holiday sides." It's just what it sounds like - all side dishes. So all you need to do is cook the main dish, open a bagged salad, and pick up dessert at the bakery. 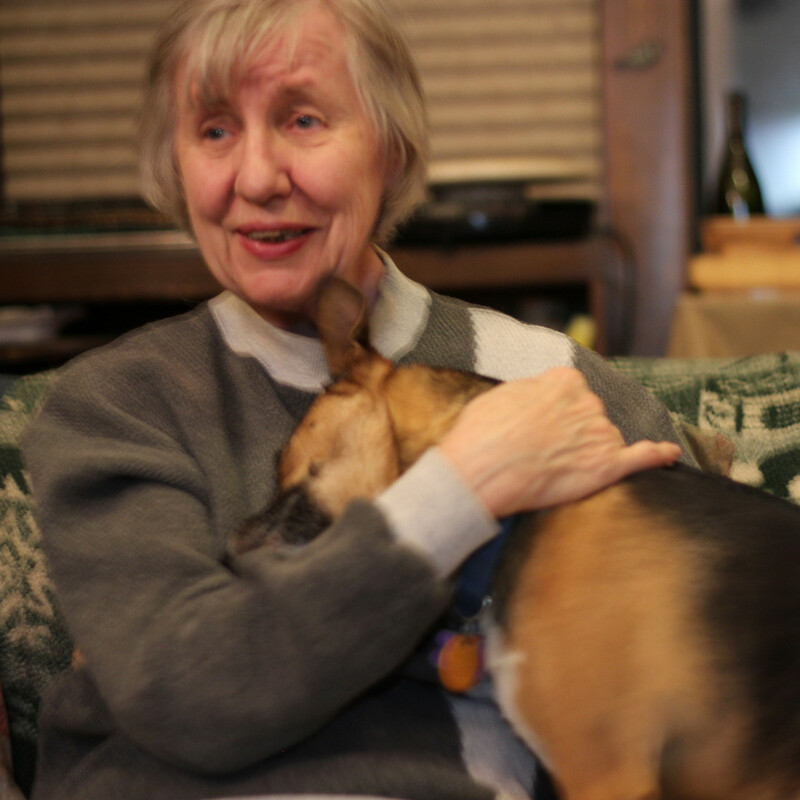 Everyone had a nice, relaxed meal and enjoyed the holiday, including Mom and Snickers.. 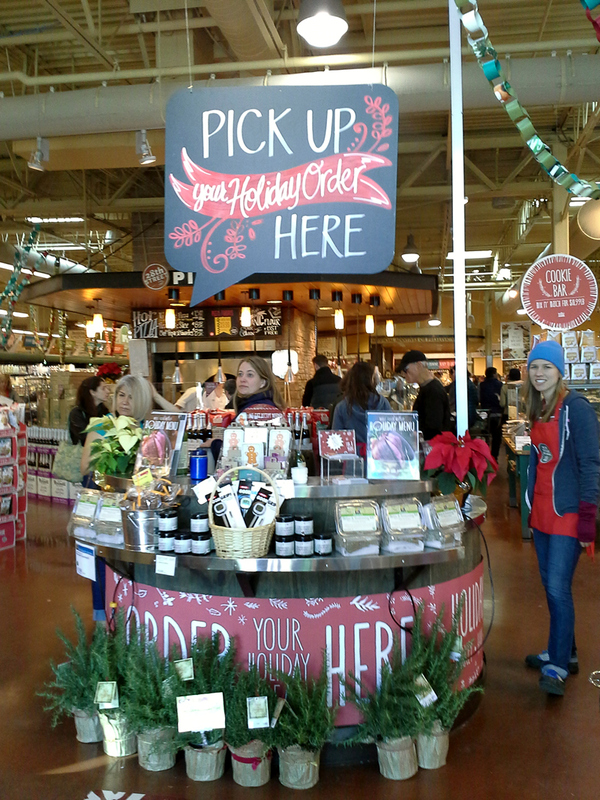 Thanks again to Whole Foods for being such a great place to blog for, and for the fantastic meal. It gave me time to rest up and make plans for Christmas! But if you're pressed for time, too stressed to cook, or your kitchen's not capable, they're ready to cook your Christmas meal for you. So, tell me, have you ever catered a holiday meal? What did you think?